Anne Teresa De Keersmaeker is back on the iDANS stage, this time with her seminal work Rosas danst Rosas that will be presented for the first time in Turkey. After the international breakthrough of her 1982 creation Fase (presented at iDANS 05 in 2011), the choreographer had surprised audiences once more with her powerful composition. Becoming a huge international success at its onset in 1983, the production had also marked the start of the Rosas Company. It was performed countless times all over the world. It became a classic and in the 30 years since its creation it has been learned over and over by new groups of dancers. In 1997 Thierry De Mey (presented within iDANS 02 in 2009 with his Light Music) made a film of the work in which the various casts and generations came together. 29 years later, Anne Teresa De Keersmaeker is once again taking her place on stage to dance along with three members of the third generation. This very piece has also been the subject of a recent controversy regarding issues of ‘author’s rights’ and ‘choreographic plagiarism’ marking an interesting instance of the marriage of avant-garde art with popular culture. Rosas danst Rosas is a prefiguration of the tensions that characterize Anne Teresa De Keersmaeker’s work, these being the contrast between rational structure and meaningful emotion, the dialectic between aggression and tenderness, the interaction between unison and counterpoint, and between uniformity and individuality. Anne Teresa De Keersmaeker (1960) is a pioneer choreographer who has revolutionized European dance since early 80s. From 1978 to 1980 she studied at MUDRA, the school founded by Maurice Béjart, and in 1981 she studied in New York at the Tisch School of the Arts. From her first production Asch (1980) she has displayed extraordinary sensitivity in merging movement with music, often working with composers to create her pieces. After the international breakthrough of Fase, four movements to the music of Steve Reich she founded her company Rosas in 1983 and within the same year she created Rosas danst Rosas, with music composed by Thierry De Mey and Peter Vermeersch. De Keersmaeker won the Bessie Award (New York) for this piece in 1988. Since 1992, Rosas has been company-in-residence at Brussels’ Théâtre Royal de la Monnaie/De Munt. ERTS, a large-scale production, and Rosa, created for a film directed by Peter Greenaway, were her first projects there. Since then, she has made works featuring a complex structure of movement, gesture and texts, set to many different kinds of music. In 1995 she founded her dance school P.A.R.T.S. – Performing Arts Research and Training Studios – which is an important centre of contemporary dance that offers a four-year curriculum and houses talented students from all over the world. She has received the French government’s Officier de l’Ordre des Arts et des Lettres (2000) and la médaille de Vermeil from the City of Paris (2002). In 2001, King Albert II of Belgium conferred on her the title of “baroness”. The latest addition to her countless awards is the 2011 American Dance Festival Award for Lifetime Achievement. De Keersmaeker’s En Atendant was premiered in Avignon Festival in 2010. With this piece she took a new step in her exploration of the combination of music and dance. This time her starting point was the “Ars Subtilior”: a complex and intellectual form of polyphonic music from the 14th century that is based on dissonance and contrast. Her latest creation Cesena, again based on “Ars Subtilior”, and set as a counterpart to En Atendant premiered in Avignon Festival in July 2011. In 2012, she published Choreographer’s Score: Fase, Rosas danst Rosas, Elena’s Aria, Bartók that unfolds as a conversation with the performance theorist and musicologist Bojana Cvejić. Most recently she, created a duet with Boris Charmatz based on the Chaconne of Johann Sebastian Bach’s second Partita. The piece premiered in Kunstenfestivaldesarts in May 2013. 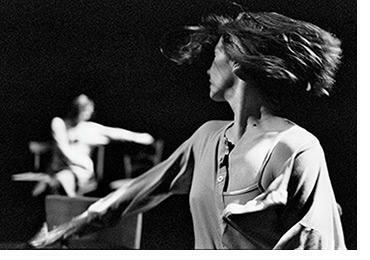 1983 saw Anne Teresa De Keersmaeker’s international breakthrough with the piece called Rosas danst Rosas. This production opened at the Kaaitheater Festival in Brussels and at the same time signaled the official inauguration of the Rosas Company. The four female dancers who originally formed Rosas were all ex-students of Mudra: Anne Teresa De Keersmaeker and Michèle Anne De Mey were joined by Fumiyo Ikeda and Adriana Borriello. The music for Rosas danst Rosas, composed by Thierry De Mey and Peter Vermeersch, came into being in parallel with the choreography. The performance is composed of five parts, and both the dance and the music are based on repetitive, minimalist principles. In Rosas danst Rosas, which has in the meantime been filmed under the same title, two sorts of movements are interwoven with each other. On the one hand there are abstract movements that are hard to label, and on the other, more concrete, recognizable gestures are also used: running the hand through the hair, pulling a blouse straight, a sudden turn of the head, etc. These gestures have a direct significance because they refer to everyday movements. It seems as if minor occurrences during the working process have crept into the performance as literal quotations. But it is not only by way of the movements that the performance’s illusory closeness (‘it’s only dance’) is constantly broken open towards a more mundane reality. For instance, in the intermezzo between the first and second parts, the dancers themselves put out chairs and shoes, iron their clothes, and clearly take the time to get their breath back. And again, at the end of the fourth, physically very demanding part, the dancers openly show their fatigue: they stand there audibly panting and visibly sweating on stage. performances; even performances of modern choreographies usually involve the concealment of effort and fatigue. By contrast, in De Keersmaeker’s work, also after Rosas danst Rosas, there is often a denial of the illusion that a dance performance shows a reality totally different from that of everyday physical life. It can be seen, for example, that De Keersmaeker never aspires towards supremely perfect performances of her choreographic works: she allows her dancers to carry out simultaneous movements with less than absolute perfection. For this reason performances by Rosas always have a particular expressiveness and ‘humanity’. The first part of Rosas danst Rosas is set on the floor and in silence. In rolling movements, and with intermediate steps, the four dancers lying on the stage build up one great diagonal movement from upstage right to downstage left, accompanied by the purely ‘human’ music of panting, of arms tapping against the floor, the sound of rolling, etc. The second movement takes place in small rows of diagonally positioned chairs (comparable to the “Come Out” section in Fase). The movements consist of quick, hard, energetic gestures responding to the percussive music with its metallic-sounding beats. The third part is, like the first, a play between straight lines and diagonals which is accentuated by the corridors of light in which they move. The chance or deliberate baring of one shoulder (the ritual of seduction?) is one of the most striking concrete gestures in this section. The fourth section is a group dance and moves with a marked crescendo to the limits of physical exhaustion; diagonals, straight lines and circles alternate. The closing section is a very short coda consisting only of genuine, concrete gestures linked to the dancers’ exhaustion. There is still a great deal of dancing by the four women in unison throughout the piece, but even so all possible variations on the number four are tried out. For example, three dancers make the same movement, while the fourth goes counter to it; or they follow a course two by two, or one plus one plus two, or one plus two plus one, and so on. In Rosas danst Rosas also arose for the first time several areas of tension which were to become characteristic of the whole of De Keersmaeker’s later work. In particular there is the contrast between rational (‘premeditated’) structures and meaningful emotions, the dialectic between aggression and tenderness, or the interaction between uniformity (of clothing or movements) and individuality (the separate accentuation of their identical clothing by means of the dancer’s varying physiques, or the individual accents in the execution of movements in unison).